Get Real-Time Notifications and Reminders to Improve Efficiency. For a 14-Day Free Trial, click here! 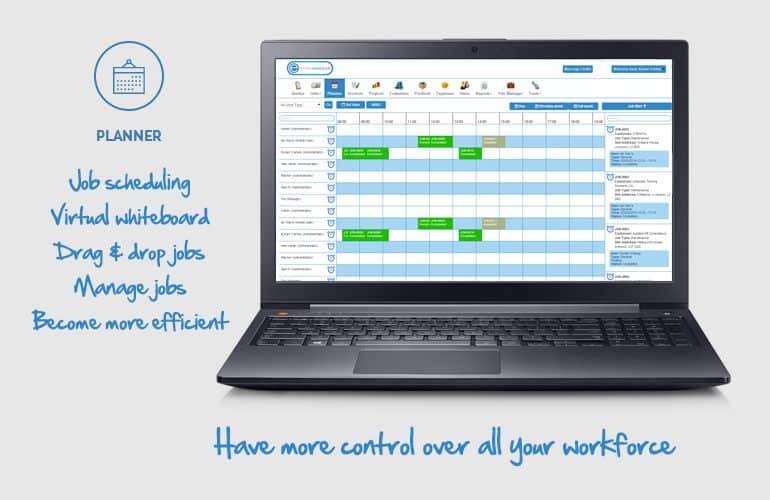 Full Featured Scheduling System Designed to Manage and Streamline Your Entire Business from Start to End. Setting up a Trigger for leads will make sure your sales team are keeping track of potential customers. One of the Triggers that you can set up for you leads is to have the system notify another member of staff when a quote has been generated from a lead. Quoting phase is one of the vital stages of business, it requires staff to act promptly. Eworks offers various Triggers in its scheduling system to remind or notify staff when an action takes places around a quote. For example, you can set up a Trigger to notify your scheduling staff when a quote has been converted into a job. This means staff can act quickly and assign the job out as soon as possible instead of waiting to be told to do so or eventually stumbling across the unassigned job. When jobs are in progress, certain things can happen which need office intervention. Setting up various Triggers for jobs will ensure staff are keeping a close eye on job activity. For example, when workers action the parts needed feature on the mobile App the system will notify the office so they can order the parts immediately, or if a job hasn’t been sent for invoicing for a certain amount of time, certain staff can be reminded to do so. SLA’s set up in the system will run as recurring jobs. These jobs will be raised in the system based on the rule set up in your recurring job. A Trigger can be created in Eworks that when it comes time for the job to take place multiple people can be notified of this. This will be handy in the case where you have chosen to raise it as an unassigned job and once raised in the system you can assign it to a specific worker in the field who is available. For staff that need reminders to send or follow up on invoices in Eworks, you can set up a Trigger that will notify staff when an invoice has been sitting unsent for a specific amount of time or if an invoice has gone past its payment due date so they know they need to chase up the payment from the customer. When recurring invoices are set up, they will be raised in the system when they are due to be sent to your customer/s. A Trigger can be set up for every time a recurring invoice is raised in the system so that staff know they can action the invoice to either print it off or email it to your customer. When you create purchase orders in Eworks, they will need to be approved. Approval is generally done by a different member of staff to which created the purchase order. Triggers can be set up to notify the staff member they have an order waiting for approval. Eworks also has a Trigger which will notify you when a staff member has approved a purchase order so you can send it off to the relevant supplier straight away. Triggers will speed up the buying process and ultimately the job completion process. Triggers against assets can be set up in Eworks to either notify you when the asset is in for repairs, has been moved from one location to another or when an assets warranty expires. This ensures you are kept up to date with assets information instead of having to follow up with your field workers. Eworks Triggers will let you manage and monitor all expenses. Whether they are expenses added by your field worker for a job or if they are a general company expense. Triggers will make sure you have your eye on and are aware of all costs for the company. Creating Triggers around Vehicle Tracking will make sure that if the device is unplugged and re-plugged in, the system will notify the person/s you select in the setup of the Trigger. This will ensure any foul play is brought to the attention of the relevant people. Set up a Trigger in Eworks to notify staff when stock quantities are running low. This ensures you never run out of stock and makes sure staff are ordering stock from suppliers before stock runs out. Stock thresholds can be set up per product and per location.